Western Environmental Liner offers softball and baseball field covers that are custom-manufactured to your specific requirements. Our athletic field covers are made completely in the USA and are of superior quality for durability, effectiveness, ease of placement and UV and weather resistance. Keeping your baseball field pristine for all purposes requires water management and weather and turf protection. 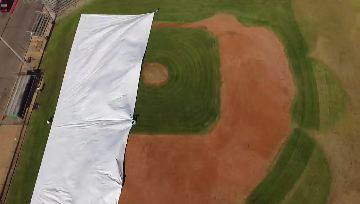 We supply mound covers, infield protectors for moisture management and turf protection during practice, and all custom covers for your purpose. Our field covers come with heavy-duty pull handles on all sides and corners for easier spreading and refolding. Our covers are made from 12-ft wide materials to reduce the number of seams needed, and the HDPE thread used in our tarps consists of the highest quality resin on the market today. It gives our covers excellent tear and puncture resistance. Our field covers and tarps are woven from our Aqua line of Reinforced Polyethylene (RPE). Western Environmental Liner’s own proprietary coating is applied to enhance abrasion resistance, flex resistance, seam strength, UV resistance and longevity. Aqua 12 is 12mil RPE, 6.3 oz per square yard, in black or other colors. Aqua 15 is 15mil RPE, 7.3 oz per square yard, in white, blue, silver, black or other colors. We can supply a variety of other materials to suit your particular needs, including a lighter version of Aqua 12 to save you money. And of course, we can go heavier depending on the project requirements. Western Environmental Liner manufactures both the sub-surface liners for storm water recapture and the surface covers that protect your field above the ground. For perfect coverage to protect and enhance your softball or baseball field, turn to our 30 years of experience in quality containment liner and cover manufacturing. We have 3 factories in the Southwest, Midwest and East Coast, and service teams across the country. We can custom fabricate whatever you need, quickly and reliably. For any questions and inquiries call today and one of our experts will be happy to assist you.